What? A post about basketball? - My journal. Yes. What? A post about basketball? · What? A post about basketball? What should the Timberwolves' new slogan be? Wolves B-ball: A sort-of quality product, in a Made In Malaysia kind of way. Wolves B-ball: We've got Kevin Garnett.....'s old jersey. 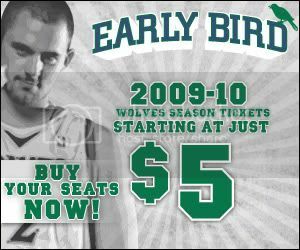 Wolves B-ball: You can't get those tasty Target Center hot dogs unless you buy a game ticket! Wolves B-ball: On average, we have higher attendance than the minor league baseball team over in St. Paul. Wolves B-ball: We're not really the Bengals of the NBA. The Bengals have been to a championship game. Wolves B-ball: No, we are not too proud to beg.